Excited to announce the gender of our little one! When I saw my OB’s number pop up on my caller ID, my heart fluttered. I knew it was one of the nurse practitioners calling to share the results from a recent blood test I took to determine Baby Tarpley’s gender. I excused myself from the video conference call I was on and picked up the phone. “Are you ready for the fun news?” the nurse practitioner asked. A few screams, squeals, and shrieks later, I returned to my conference call, hardly able to keep my composure. I called the restaurant where Troy and I were planning to eat on Friday night and asked if they could keep the cake for the afternoon and serve it to us after dinner. 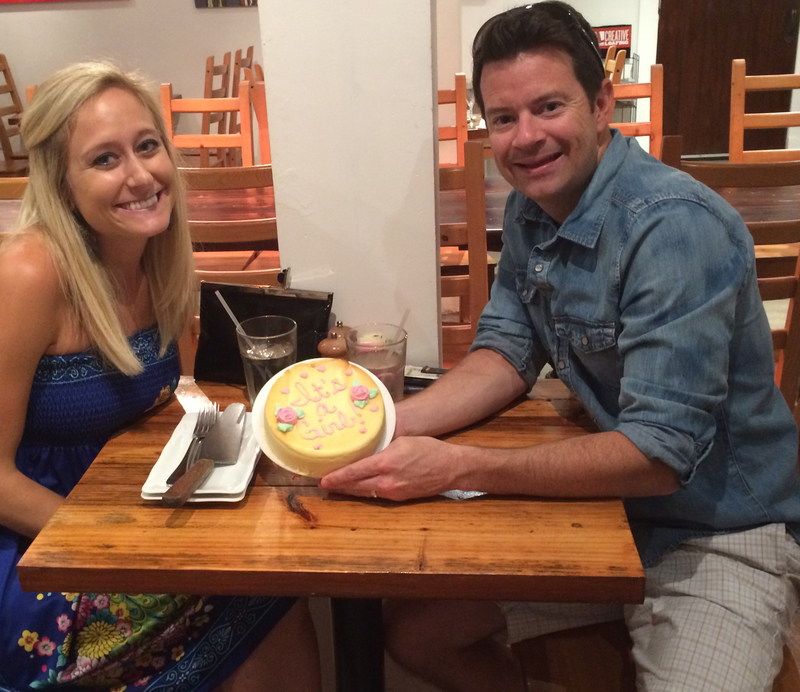 The same girl I talked with and who I gave the cake to ended up being our waitress later that evening. It was hard not telling Troy when he came home from work. It helped, though, that he didn’t know the nurse would be calling me earlier in the day. I had gotten the blood work done in July, and we had been anxiously awaiting the results for weeks. 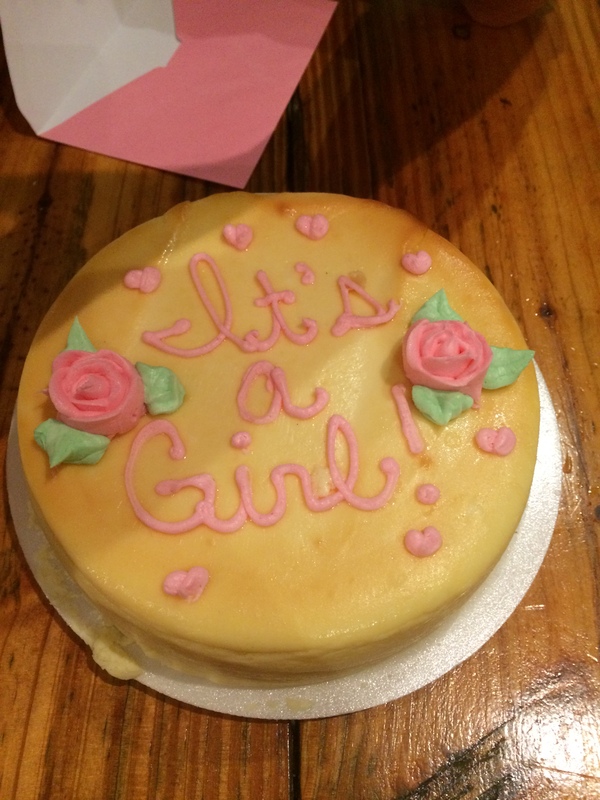 Family had been asking if we had found out the gender yet, and we kept wondering when we’d finally be able to give them an answer. During dinner, the gender conversation naturally came up, but I somehow managed to pretend that I hadn’t heard anything. At Alesia, one of our favorite restaurants in St. Pete. Once dinner ended, I could see the waitress getting the cake out of the refrigerator and putting it on a plate. My heart pounding, I quickly told Troy I had some news to share with him. I got my phone out as the waitress set down the cake. Unable to stop smiling, Troy let out a lot of “wows!” and “holy cows!” It made me so happy to see him happy, to know that gender wouldn’t ever alter our love for our little baby. For as much as Troy wanted a boy, I could tell he would be just as content with a girl. “Knowing you wanted a girl makes me even happier that it’s a girl,” he told me. I had a feeling all along that it would be a girl. Maybe because I’ve always pictured having a girl (well, two or three girls, actually!) Having lost my mom when I was 11, I’ve wanted to carry on the mother-daughter relationship that I cherished as a child and wished I had later in life. I want to be the mom who can live to see all the milestones that my own mother never got to experience — graduations, first jobs, weddings. And I want to pass on lessons that my mother and grandmothers taught me — about gender stereotypes, ambition, and beauty. Even though I’ll want to dress our girl in pretty bows and dresses when she’s young, I’ll also want to teach her that she can grow up to be whatever she wants to be — an engineer, a biologist, a writer, a professor, a CEO. I’ll want to show her that beauty comes in all different forms and isn’t defined by a number on a scale. I’ll want to remind her every day that she is unconditionally loved. 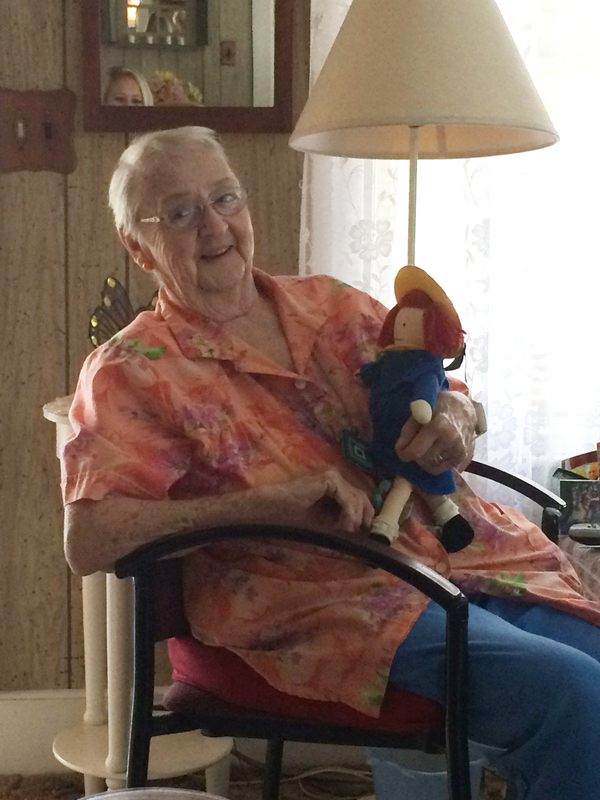 My grandma with Madeline the doll. Throughout my pregnancy, I picked up on hints that the baby inside me was a girl. When Troy and I visited my maternal grandma on July 24 (what would have been my mom’s 59th birthday), we told her that she was going to have a new great grandchild. After we shared the news, I had an urge to go upstairs to my mom’s old room. (My grandma still lives in the same house where my mom was raised.) I hadn’t been up there in years. When I walked over to my mom’s old bed, I saw a Madeline doll. I sat on the bed and held it tight, thinking back to the time when my mom bought me a Madeline doll years ago. I don’t know where that doll is now; it’s likely camping out in a box with other long-lost toys in my dad’s attic. My grandma propped Madeline on her lap, took an admiring look at her, then told me she wanted me to have her. When I got back home to Florida, I put the doll in what will soon be our baby’s nursery. 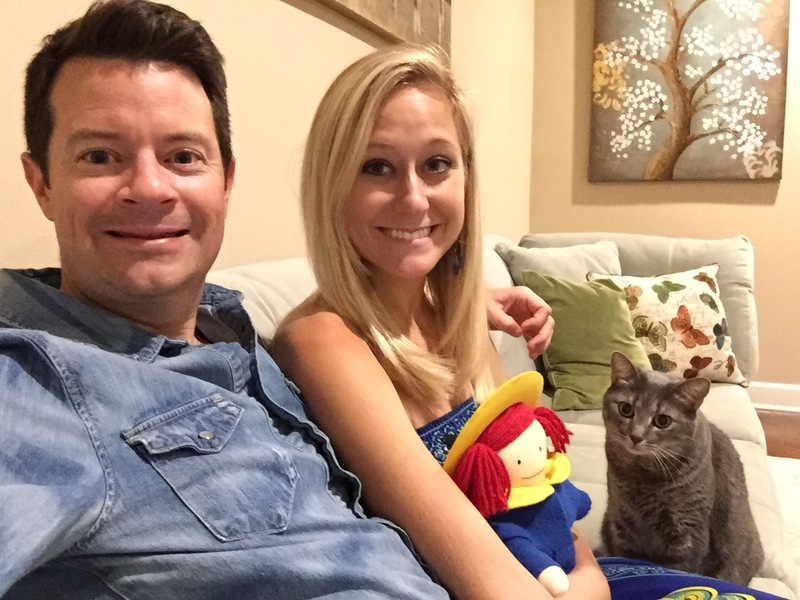 Friday night, after finding out the gender, I brought Madeline the doll downstairs and took a photo with her, me, Troy, and Clara the cat. I thought about all the changes that are about to happen in our lives, and the reality that Troy and I will soon be holding a real Madeline (or Madelyn?) in our arms. We can’t wait for that special day to arrive. It’s difficult keeping a secret that affects your mood, your energy levels, and the size of your belly. After months of waiting, though, Troy and I can finally share the good news: we are expecting a little one in February 2016! We’re so incredibly grateful that I got through the first trimester without any complications and that we’re going to be parents. 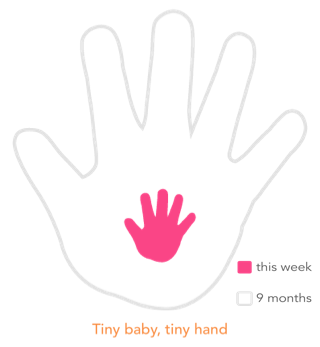 This little baby inside of me is steadily growing, and I now have a (tiny) bump to prove it. It has tiny arms and legs, its brain is undergoing rapid development, and it’s currently the size of a big plum. Despite all the worries I’ve experienced throughout the first trimester (and the nausea and fatigue), I’ve felt a deep level of comfort — the kind of comfort that comes from knowing that the loved ones you’ve lost in your life are still with you. Ever since my mom died of breast cancer when i was 11, I’ve spotted signs from her. I’ll hear “I Will Remember You” — the song that she dedicated to me before she died — when I’m thinking about her or missing her. Other times, when I’m having a bad day, I’ll see a robin, a bird that shares the same first name as my mom. Or I’ll see my mom’s “special time,” 7:24, symbolic of her July 24 birthday. My paternal grandma — Gramz — knew all about these little signs and used to call me when she spotted them. Gramz helped raise me after my mom died and became my maternal sounding board, my second mom. I turned to her for just about everything, and always knew that she’d freely give me her honest opinion and words of wisdom that can only come from years of experience. As I got older and moved to Florida after college, we didn’t talk quite as much as we used to. But I still considered her to be like my mom, and turned to her for advice about buying a house, getting married, and becoming pregnant. In April, I told her that Troy and I wanted to have kids and that I’d been trying to get pregnant since January, after running my first marathon. “I don’t know why it hasn’t happened yet,” I lamented. “Mal, you’ve only been trying for three months!” she said, reminding me that what felt like an eternity was far from it. “It took me two years to get pregnant with your father and I was 31 when I had him.” I never thought about how old my grandma was when she was pregnant with my dad, but realizing that she was just about my age (in the 1950s, no less) made me realize that I still had time — that my timeline for getting pregnant wasn’t going to pan out exactly as planned and that was ok.
That was the last conversation I ever had with Gramz. She died a couple weeks later at age 92. When she passed, I wept. I couldn’t help but think about the fact that she and my mom wouldn’t get to throw me a baby shower, or share their pregnancy stories with me, or offer up newborn advice.They wouldn’t get to meet our little baby. In the days after Gramz passed away, I secretly hoped that my mom and Gramz would work their connections in Heaven and help me get pregnant. You determine your due date based on the first day of your last period. I got my last period the day of my grandma’s funeral, shortly after I walked into the funeral parlor. My due date is February 3 — just a few days before the anniversary of my mom’s death. Sandwiched between these two bookends that symbolize the passing of my two moms, a life is emerging. And I’m becoming a mom. As I think about this next step in my life, I’m reminded of the cyclical nature of life. When one person leaves our lives, something or someone else often steps in to fill the void and ease the pain. Signs emerge, reminding you of the life you’ve lost and sending you clues about how the void will be filled. 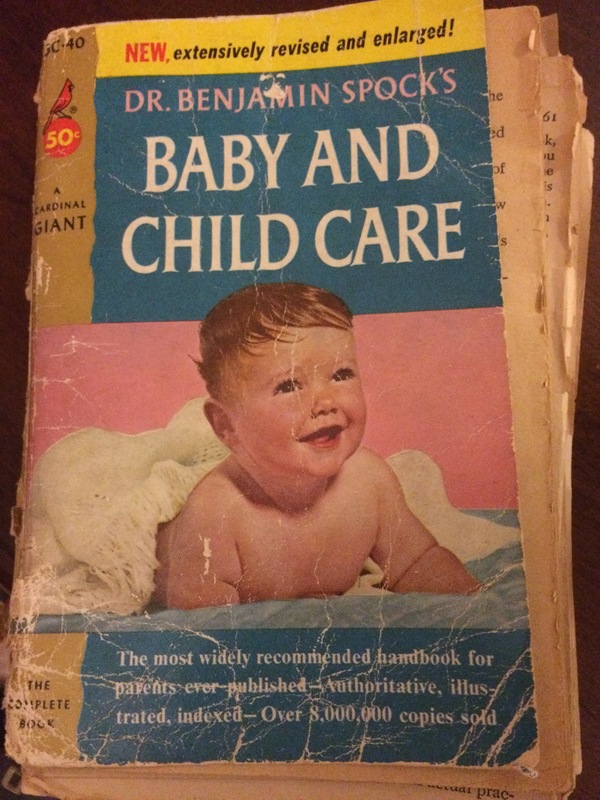 A couple days after my Gramz passed away, I looked through her house with my dad and found a tattered 1956 copy of Dr. Spock’s famous “Baby and Child Care” book in the back of one of her drawers. It was the book she referred to when raising my dad and uncle. I took it home and kept it by my bedside, hoping I’d soon have a use for it. The other week, I came across an invitation to my baby shower from 1985. It had my mom’s name on it, and my grandma’s handwriting. She had used the back of the invitation to write down a grocery list of food she wanted to buy for the shower — a typical move for Gramz, who always nourished our bellies and our hearts with food and love. Gramz had sent me a copy of the invitation a couple of years ago, thinking I would like to have it. I had misplaced it until I recently found it nestled in a stack of old family photos. I’ve kept these signs, these maternal memories, close to heart and have no doubt that they’ll keep popping up throughout my pregnancy. It still seems surreal to know that there’s a little baby inside of me. With each passing day, though, it feels more real. I recently heard the baby’s heartbeat and my little bump is starting to protrude more. Troy kisses it every day. I’ve been listening to lullabies, even though the baby can’t hear yet. I’ve been reading books galore, and recently read that if I poke my belly at this stage in the pregnancy, the baby will wriggle around. Even though it’s too early to feel it kick, I can picture Baby Tarpley having its own little dance party inside the womb. 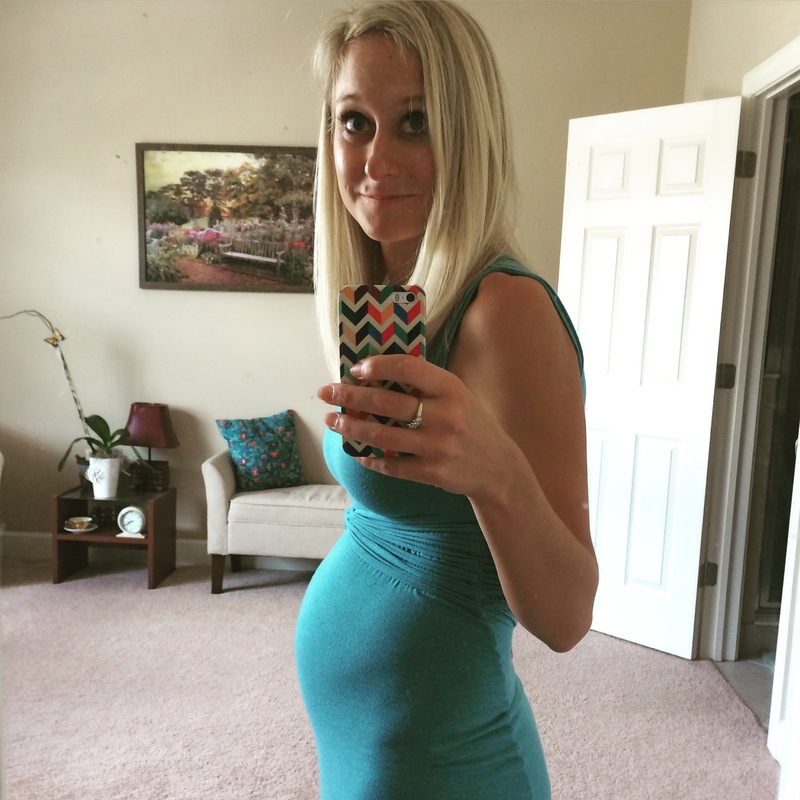 Pregnancy has been an eye-opening experience for me on so many different levels. It has changed how I manage stress, how I care for myself, how I eat, and how I feel about my body. It’s changed me in ways that I wasn’t sure were possible. There are so many related essays I want to write, so I’ve created this blog as a home for those essays (and for pregnancy — and eventually baby — photos!) I want to share this experience with all of the family, friends, maternal and paternal figures that Troy and I are fortunate to have in our lives. It’s a relief to know that I’m heading into my second trimester and that this little baby inside of me is no longer a secret. It’s a precious gift, a bundle of joy — one that Troy and I can’t wait to bring into the world.